The State’s occupational forecast projects short- and long-term employer demand for detailed occupations at the regional level. The improvements made to the occupational forecast over the last seven years have generated strong interest in using the forecast as a planning tool for education and training providers. However, the lack of a definitive guide linking instructional programs to occupations limits the ability to develop systematic benchmarks from the employment forecast. The solution to these problems is in the development of a crosswalk between instructional programs and occupations. 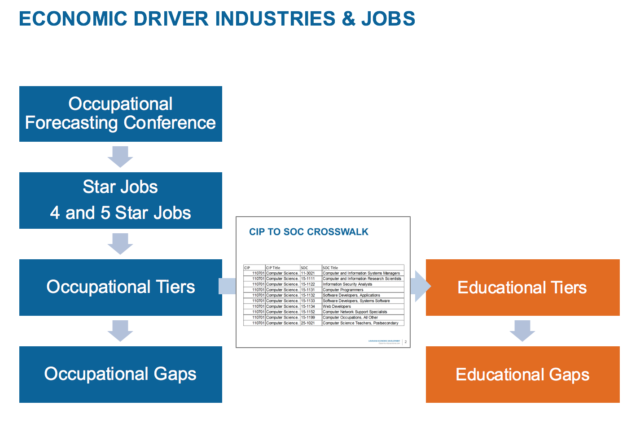 Instructional programs are tracked using the Classification of Instructional Programs (CIP) and occupations are tracked utilizing the Standard Occupational Classification (SOC) System, and the connection is commonly called a CIP-SOC crosswalk. The National Center for Education Statistics (NCES) publishes a CIP-SOC crosswalk, but it has limitations that prevent it from being actionable for policy planning purposes. Work is needed to develop a Louisiana-specific CIPSOC crosswalk with a data-driven link between programs and occupations accounting for the likelihood of an easy job match. The State CIP-SOC Workgroup, comprised of representatives from the four Systems (LCTCS, LSU, SU and ULS), Louisiana Economic Development, Louisiana Workforce Commission and the Board of Regents meet jointly to advance this initiative and create a Louisiana-specific CIP-SOC Crosswalk to aid in addressing the state’s workforce gap.